Selecting the most relevant KPIs for each business department represents one of the biggest challenges. Based on our extensive global research experience we have developed a wide-ranging collection of dictionaries and reports that aim to provide the most insightful and relevant Key Performance Indicators used in practice today. 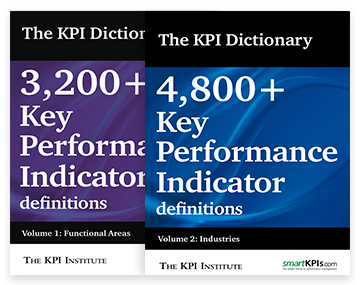 The KPI Dictionary do not only define the indicators, but also contain explicit presentations of the calculation formula for more than 8,000 KPIs. They can be used in the early stages of implementing a performance management framework, in the process of selecting and documenting KPIs, but also to improve an existing performance measurement system. The Top KPIs Report series is a synthesis of what smartKPIs.com is all about: they form an overview of how KPIs are used in practice today, by combining input from the online community with analysis and insights from the Institute research team. 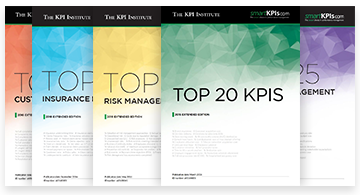 A new edition of the Top KPIs Report series is going to be launched by The KPI Institute research division each year. Top 25 KPIs of the year for Industries – reports containing the most popular 25 KPIs of the year by industries. Valuable resources to informing and addressing the year’s performance management and measurement challenges. Section 6: Contains the detailed description of each KPI listed in that report, as documented in smartKPIs Premium (the premium content section of smartKPIs.com). × Your email has been sent! in exchange for filling in a 10 minutes survey!